Looking for a crab recipe? Look no more! 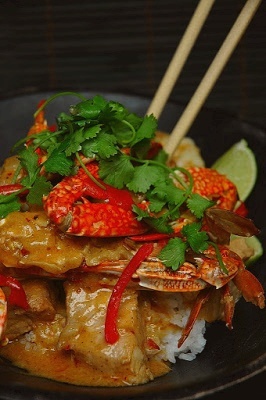 This Singapore crab curry can be made at home with a lovely rice vermicelli. Easy and delicious crab curry recipe to cook beautiful meals yourself today! Dice the onions, dry shallot and ginger. Heat the oil and fry these ingredients. Dice the garlic and fry till fragrant. Pound the tomato and add it into the wok and fry well. Add in ginger powder, curry powder and paprika. Fry well through gently for 2-3 minutes. Chop the crabs and fry them with the ingredients. Add in vermicelli and fry well. Add in choopped spring onions and salt to taste. Mix well over high heat. Note: This dish is of strong flavour and taste well when eaten with rice. Enjoy! Garnish with a little fresh coriander leaves as you wish. great recipe for curry crab! no hassle and easy to cook! this one singapore crab recipe meh? ?